Here's your starring moment at L.A. Live, pirouette people. An ice rink with an epic, lit-up, world-famous setting? 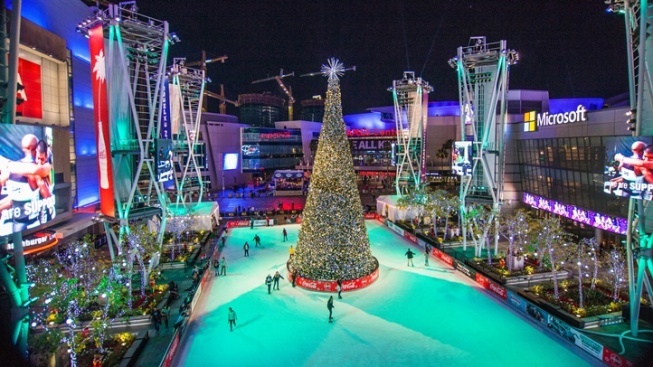 It's at L.A. Live through Thursday, Dec. 21. Zooming across a frosty surface in pursuit of a puck with the several stars from the LA Kings at your side? It's a daydream of many people 'round the region. And while pursuing that puck in a major showdown might remain a fun fantasy for many a hockey fan, strapping on a pair of skates and doing some laps at the LA Kings Holiday Ice rink is very much in the cold cards. That is, for anyone who wants to make the journey to L.A. Live through Thursday, Dec. 21 and pay twenty bucks for rink admission. It's not the rink that the team uses, but, being outdoors at the entertainment complex, it isn't far. And an added bonus? You're pirouetting amid all of those brightly lit signs and screens that keep L.A. Live looking positively daytime-ish, even after sundown. More bonuses? It's rocking right through to midnight each day, making it one of the open-later rinks around the area. And if you show your admission ticket at some of the nearby eateries, you may score a discount on a beverage or meal (so tuck it deep down in a pocket, so it doesn't come flying out as you spin upon the glassy surface). And the skate rental that's folded into your admission price? Oh yeah: They're hockey skates, so you can feel like you've got the baddest (as in goodest) of blades underneath your feet. For all the stuff you need to know about one of California's star rinks, and one of the few team-related seasonal attractions around, the puck you need to pursue is zooming in this direction.